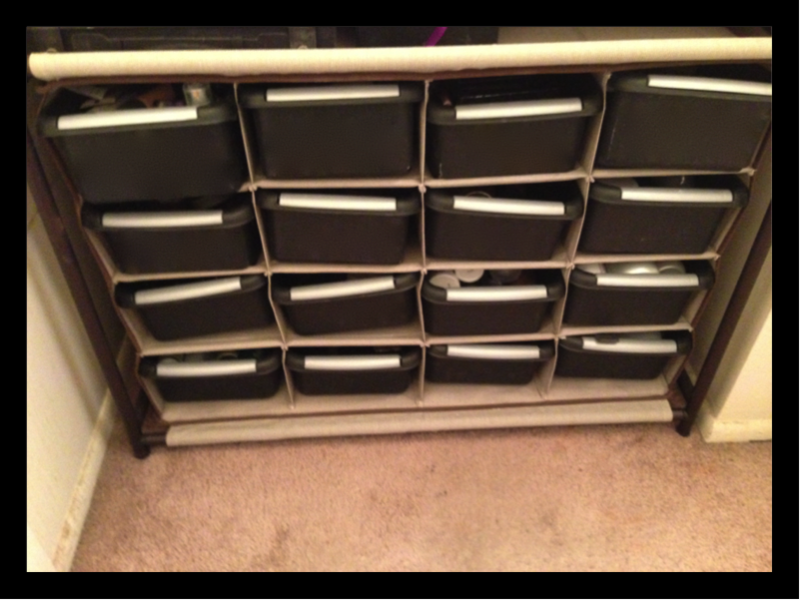 I recently undertook an essential project: organizing my makeup. I usually have my current go-tos in a makeup bag and everything else just stashed here and there. I got tired of not knowing what I owned and not having an easy way to rotate through my different products. One weekend, I had had enough. Here's the problem--in my little studio apartment, storage space is at a premium. I don't have any bathroom storage, because my bathroom is nothing more than a toilet and shower. My sink and mirror are right outside the bathroom, but I don't have a medicine cabinet or an under-sink cabinet or any such cabinetry. I went to Walmart and bought a shoe storage rack and a bunch of little bins. Total cost was right around $30. Then I just put the baskets into the shoe slots. The best decision I made was putting the baskets in according to the order I use the products when I get ready. So starting top left are my primers, foundations, and powders. Then eyeshadow pallets, eyeshadow single colors, eyelash and brow products, bronzers and blushes, etc., etc. The system has been in place for a few weeks, and I love it! While I was in an organizing mood, I also hit up my closet. I wish I would have taken a "before" picture so you could see that the end result is actually very impressive. I had to move all of my pants to my coat closet, but I think it was worth it. Wouldn't it be cool if my purses matched up color-by-color above the clothes? I'm close, but not quite there. What have you done lately to help you feel accomplished? How do you organize your beauty products? How do you handle storage shortages? I'd love to know!